All The God All The Time? I love the name, too! Great shot! I’m gonna dress as Santa and ride MoonShine out to give toys to my grandson at Christmas. 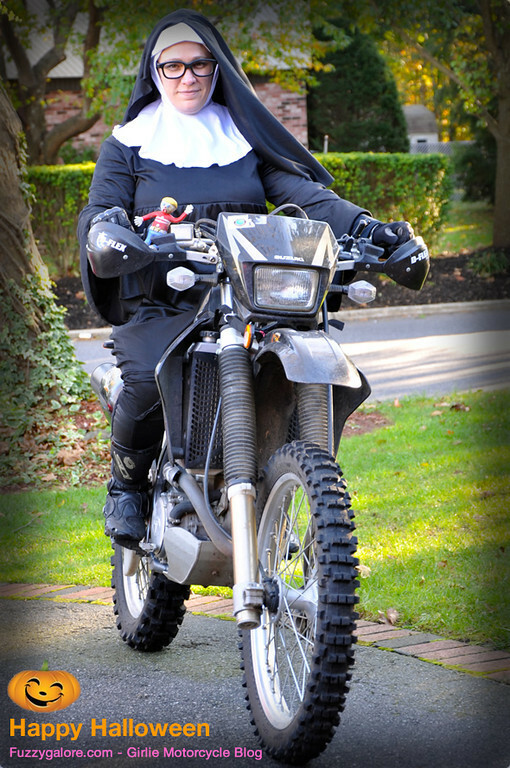 I’ll have to think of something motorcycle related to dress up as next Halloween. Oh, he’s going to LOVE that! Last year I bought a Santa suit and rode around in it. The joy and happiness that it brings to the people on the roads is like a gift to yourself. You see people just light up. It’s awesome. I still dress up, heck I still want to go trick or treating and get some candy! This is late for Halloween, but I just found your blog. I ride and was looking for something interesting to greet me when I open my browser. Saw your photo and had to send an illustration I did for The Hartford Courant about who takes motorcycle classes. I look forward to reading more. 2009 IBR: Catfish Makes his way to Checkpoint 1 in St. Charles, Il.